Whether you're taking a host or hostess gift to a party you're attending this holiday season like an adorable mug set or a stylish card set or simply shopping for that person on your list who loves planning a party, you can't go wrong with these fabulous gift options! Anyone who loves a party will be delighted with slate place card holders or an adorable mouse cheeseboard under the tree, not to mention a set of the Bessie Bow Place Cards from Reese Witherspoon's Draper James tucked into a stocking. For the Southern hostess who loves serving up a bit of seafood, a traditional oyster plate is just the thing. Of course, parties are sometimes best enjoyed outside, which is why a beautiful picnic basket will never go out of style and cocktail connoisseurs will get a kick out of the Alessi Boston Shaker Set for masterful mixology. 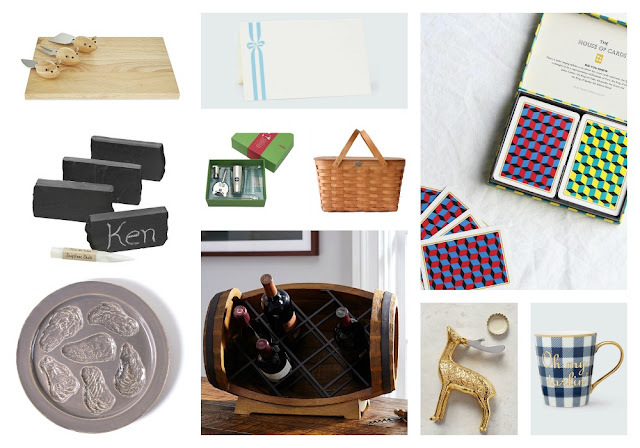 Let's not forget the tailgaters who will be ever-so-stylish opening a bottle of their favorite craft beer with a Brass Stag Bottle Opener from Anthropologie. And then there's my personal favorite in this round-up... The Pottery Barn Barrel Table Top Wine Rack for those long, leisurely dinner parties with friends when it's a shame to miss even a second of the riveting conversation to retrieve another bottle of wine for the table. Giving any of these gifts to your favorite host with the most or hostess with the mostess will definitely ensure your invites to all the best parties in 2016!